A millennial candidate has shaken up the US Democratic Party by defeating the incumbent congressman for his seat. Alexandria Ocasio-Cortez, 28, defeated political veteran Joe Crowley, 56, on Tuesday night in their party's congressional primary in New York City. Mr Crowley, a 10-term Democrat, had been tipped as a future party leader or even Speaker of the House. Ms Ocasio-Cortez, a former Bernie Sanders volunteer from a Puerto Rican family, won with 57.5% of the vote. Mr Crowley had not faced a challenger from his own party in 14 years in the mostly ethnic minority district, which covers parts of the Bronx and Queens. 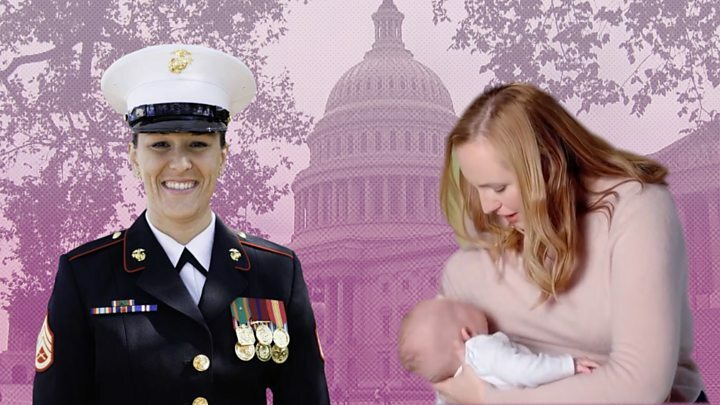 If she wins, she will become the youngest ever woman elected to Congress. Can Democrats torpedo Trump in 2018? She led a progressive campaign, supporting universal healthcare, tuition-free college and criminal justice reform. The political novice, who describes herself as a socialist Democrat, had huge grassroots support. She raised more small-dollar donations than any other New York City congressional candidate. In fact she found little support from established Democrats. Senator Kirsten Gillibrand, a top Democrat who has a political action committee designed to support women candidates, endorsed her opponent Mr Crowley. Ms Ocasio-Cortez posted on Twitter after Ms Gillibrand's endorsement that the New York senator "didn't even bother to talk to nor consider me before endorsing". Unsurprising, but disappointing that @SenGillibrand didn’t even bother to talk to nor consider me before endorsing. 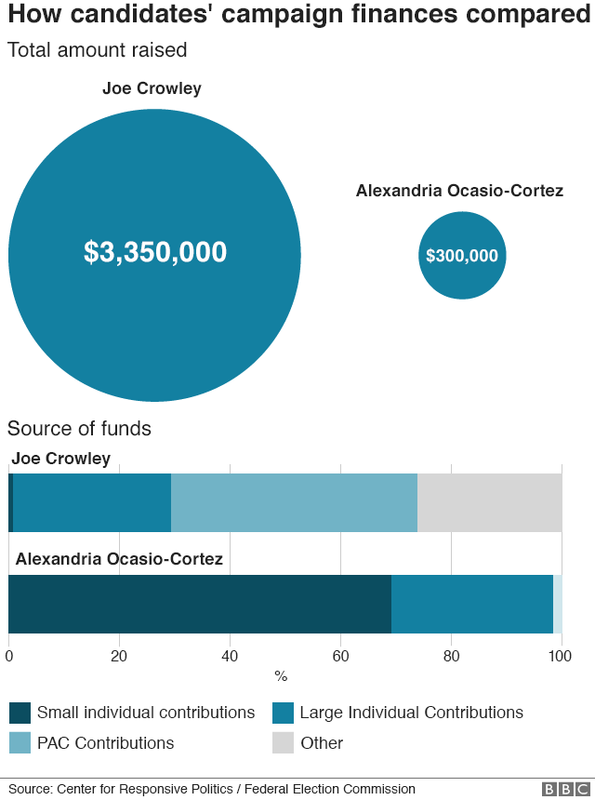 During her campaign, she criticised Mr Crowley for his ties to Wall Street and accused him of being out of touch with his increasingly diverse constituents. 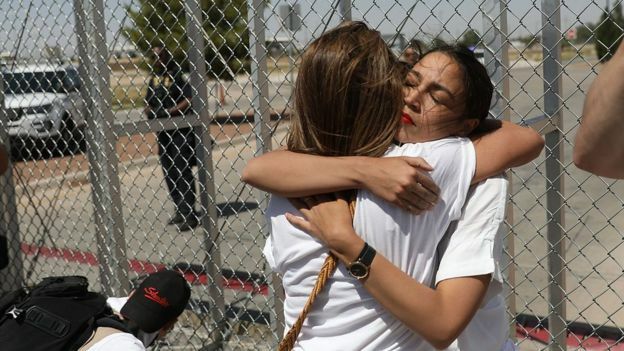 They thanked each other after the result, with Mr Crowley saying he would support Ms Ocasio-Cortez in the mid-terms. At his concession speech, Mr Crowley played guitar, dedicating the song Born to Run by Bruce Springsteen to Ms Ocasio-Cortez. Today I saw people voting that are almost never seen in an off-year midterm primary. Just now, as I’m typing this with 8 minutes left, two young men of color, 20 years old, just walked up to me and said they just voted. 2 yrs ago, the “experts” told me not to bother with them. Political analysts see her 15-percentage-point victory as the biggest political upset within a party since Republican House Majority Leader Eric Cantor lost in 2014 to a little-known right-wing professor, Dave Brat. One of the many new female faces joining US politics this year, Ms Ocasio-Cortez is a Bronx-born Latina, a community organiser and educator from a working-class background. The political newcomer made a viral campaign video in which she said: "Women like me aren't supposed to run for office. "I was born in a place where your zip code determined your destiny." She has a degree in economics and international relations from Boston University, but after graduation she worked as a waitress and bartender to supplement her mother's income as a house cleaner and bus driver, according to a profile in The Intercept. She says she decided it was time her New York City district was represented by a young progressive woman of colour after watching the election of Donald Trump as president. She described her congressional district in an interview with US news outlet Mic during her campaign. "Our median income is around $47,000 a year, we're about 70% people of colour," she said. "We've had the same representation for a generation."